I noticed that the months and dates were right, it was just the year that was off. I then noticed that most of my posts were in the AM, including some at 1 and 3AM. Now, I’m not that great of a sleeper, but even I need to sleep some time. I first looked at the code I used to index my data. 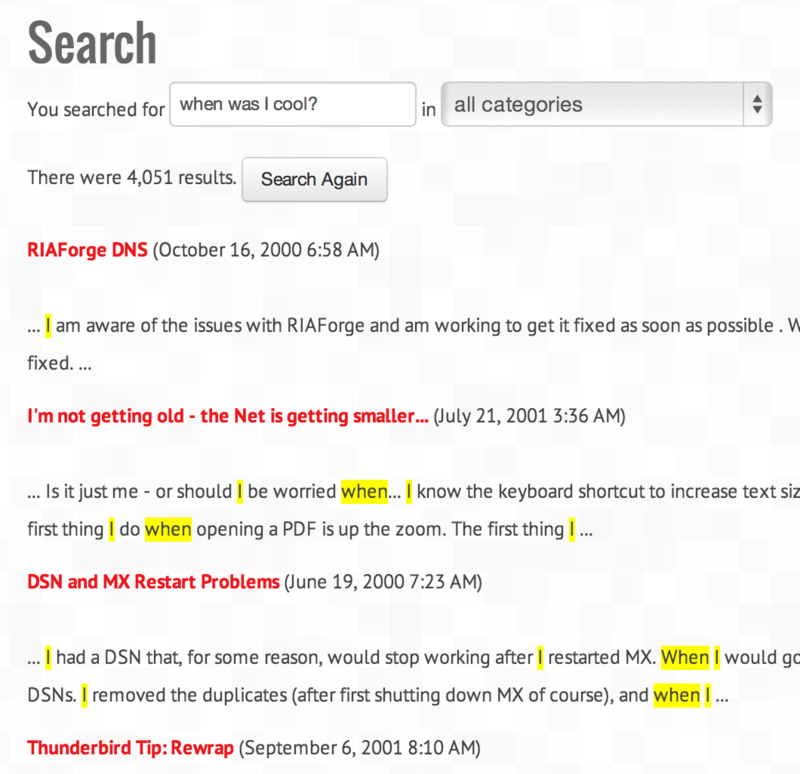 (By the way, did I mention I switched to SOLR-based searching here? Well, I did. :) This is the code used to query the database and store the results in the index. I only use this when I need to blow away everything and start fresh, but similar code is used for atomic inserts as well. Note: _dt supports only the date formats supported by ColdFusion. So it appears as if I can pass into cfindex a value that ColdFusion can handle correctly, but SOLR returns something that ColdFusion cannot handle correctly. Luckily I’ve got no issue just printing exactly what SOLR returned. It doesn’t exactly match how I show dates elsewhere, but frankly, I don’t care. I could have gotten around this - possibly - by storing the value with the postfix _s instead (ie, simple string), but again, I’m happy just displaying the result as is.